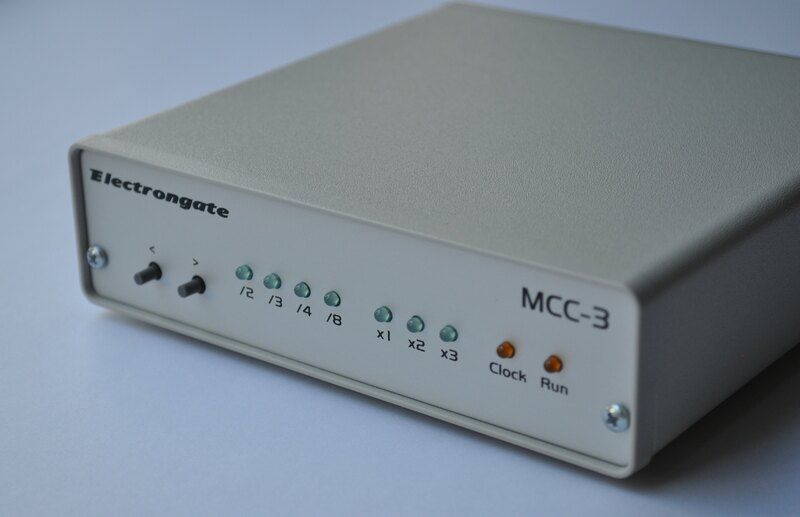 The MCC-3 converts incoming MIDI timing clocks to a simple pulse output suitable for synchronizing non-MIDI sequencers or drum machines, for generating a click track, arpeggiator clock or driving a tap-tempo device based on the incoming MIDI clock tempo. The 24 pulse-per-quarter-note MIDI clock rate can be scaled to a lower rate by a selectable divisor (2, 3, 4, 6, 8, 12, 16, 24, 32, 48, 64, 96 or 192) or scaled to the same or higher rate by multiplying by 1, 2 or 4. In addition to clock rate conversion, the MCC-3 also uses MIDI Song Start and Song Stop messages to control a Run/Stop footswitch control. This control output produces a momentary pulse when the song starts, and again when the song stops. This can be useful for controlling drum machines with a start/stop footswitch input. The Clock and Run/Stop outputs each use a 1/4 inch TS jack for a normally high (+5 volt) signal that pulses low when active. These outputs are compatible with systems that pull the output to a higher voltage level as well. The MIDI In jack recognizes MIDI System Clock, Song Start, Continue and Stop messages. The MIDI Thru jack can be used to chain additional MIDI devices. The power supply can be any DC source of +7 to +30 volts. The power connector is a standard 2.1mm DC jack. The MCC-3s converts DIN Sync (AKA Sync-24 or Roland Sync) timing clocks to a digital pulse output or MIDI clock output. Like the standard MCC-3, except the MIDI Thru jack becomes a DIN-Sync output jack. The MCC-3t generates a free-running MIDI clock output based on the rate of the "tap" input from the 1/4 inch input jack. The MIDI clock rate is a selectable multiple of the tap input rate (2, 3, 4, 6, 8, 12, 16, 24, 32, 48, 64, 96 or 192. This version has no MIDI input and no Run/Stop output. Click here for detailed instructions for the MCC-3t. Outputs: MIDI Thru DIN jack, pulse output 1/4 inch TS phone jack, start/stop output 1/4 inch TS jack. Indicators: Green LEDs for rate/power on indication, yellow LEDs for output pulse indication and run/stop state. Enclosure: 1.52 x 5.57 x 6.5 inches, vinyl-covered steel and aluminum. Power consumption: Less than 1 watt. Pulse output: Open collector (with internally switchable pullup resistor). Pulse high time = 20ms. (1, 2, 3, 4, 6, 8, 12, 16, 24, 32, 48, 64, 96 or 192) or multiply rate by 1, 2 or 4. May also be ordered as an assembled circuit board without the enclosure or power supply for $80. Other customizations are possible. Contact Electrongate for more information.